Finally, a GPU dock that's manufacturer-agnostic. There’s long been an argument about gaming laptops and obsolescence. You plunk down $2,000 on a high-end laptop and in seemingly no time it’s borderline useless. No way to upgrade. No real tweaks you can try. It’s a $2,000 paperweight. Perhaps spurred by these complaints, Alienware eventually said “Okay, what if you could hook up a desktop graphics card to your laptop? And then upgrade it whenever you want?” And thus the Alienware Graphics Amplifier was born. MSI (sort of) followed suit. Asus too. But there’s been one nagging issue in this hot-button field: proprietary claim-staking. Each of the above solutions works within its own ecosystem. Alienware uses a custom PCI Express connection that limits it to Alienware laptops. MSI’s was designed to work with one laptop. Asus’s is—you guessed it—proprietary to Asus. That’s left some people to rig up an external GPU through the ExpressCard port, a versatile but clunky solution. Back in June Intel said Thunderbolt 3 might be a good candidate for external GPU docks, given its 40 Gbps throughput. It’s not PCIe levels of data transfer, but it’s better than nothing. Also, it’s not proprietary to any one computer manufacturer. 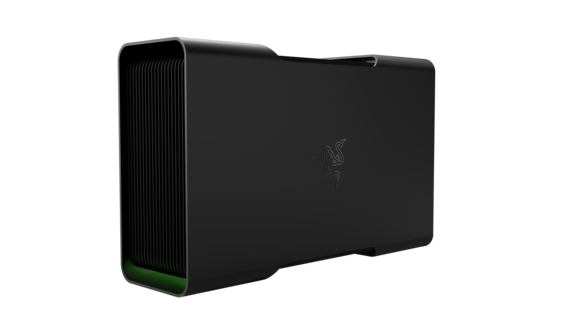 Razer’s new GPU dock is dubbed the Razer Core. Designed to work with Razer’s new GPU-less laptop, the Razer Blade Stealth, it will could in fact work with any laptop that packs a Thunderbolt 3 port. Which at the moment means not many laptops, although that number is steadily increasing. 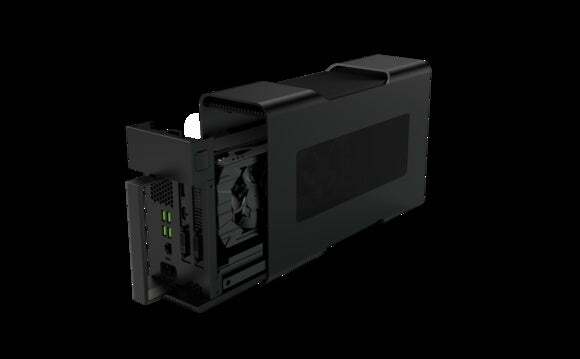 The Core is an aluminum-housed dock that slides open to accommodate “virtually every popular desktop graphics card from both AMD and Nvidia,” according to Razer’s release (double-wide, full-length PCI-Express x16 cards, drawing up to 375W of power). Cards are held in place by a screw, and then the whole enclosure slides back together. Plug it in and you’re ready to play—no reboot required. The Core itself measures approximately 8.5-by-4.1-by-13.5 inches (218-by-105-by- 340mm), with two-zone Chroma lighting, four USB 3.0 ports, and Gigabit ethernet. The question now is performance. In theory, the Razer Core sounds amazing for those who need to own a laptop but want to do some hefty gaming at home: self-contained, no need for external power, relatively small, will connect to any Thunderbolt 3 computer so you don’t need to buy from the same manufacturer for the rest of your life, and more attractive than a naked graphics card sitting on your desk. But the question remains, what kind of boost will you see when hooked in through Thunderbolt instead of PCIe? As I said, 40 Gbps is fantastic when compared to past ports (USB 3.1’s transfer speed is 10 Gbps for instance), but it’s nowhere near what you’d get plugging the same card directly into a PCIe slot on your motherboard. 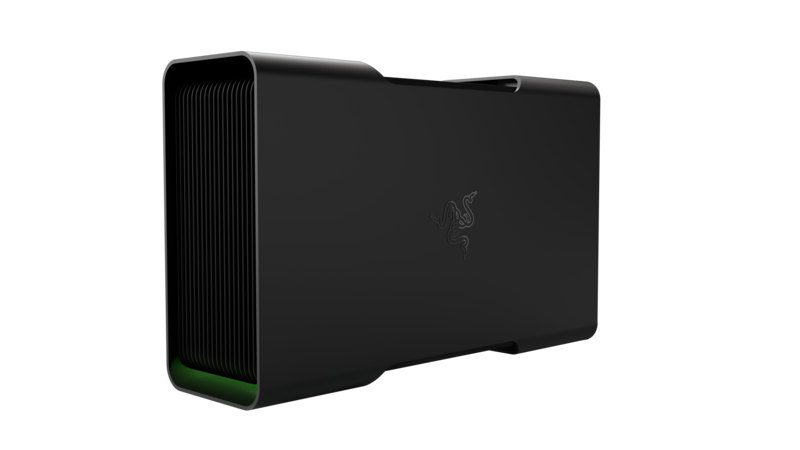 We’ll need to get our hands on the Razer Core and run a bunch of tests before we can recommend it. Still, it’s an important development—potentially the redemption that gaming laptops sorely need. While I use a gaming laptop because my job requires one, it’s always been tough to recommend something so expensive that so quickly loses value. With the Razer Core maybe you can get a few more years out of your aging hardware—or buy a cheaper laptop and supplement it with an old card you have lying around. The latter is clearly what Razer expects. 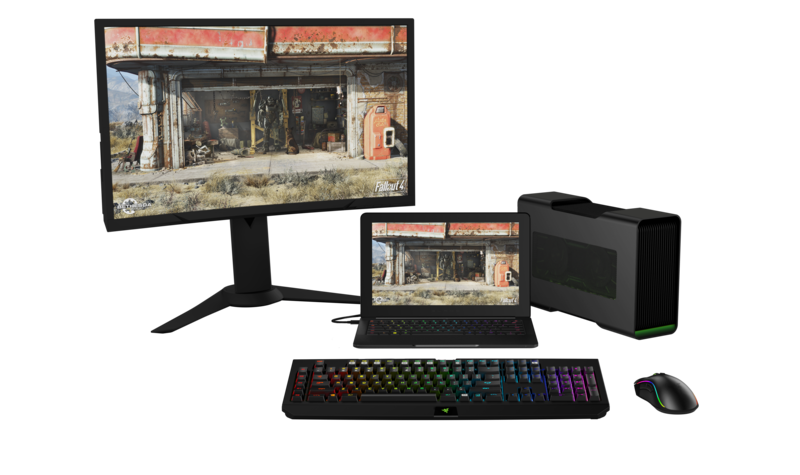 The Razer Core launches at some point in the first half of 2016, though there’s no price yet. Stay tuned to PCWorld for more news from CES all week long.